Trancework (5th Edition) | MICHAEL D. YAPKO, Ph.D. Enter Discount Code AT515 at checkout. For nearly four decades, Trancework has been the fundamental textbook for guiding professionals in learning hypnosis. Now in its fifth edition, this classic text continues to be the most comprehensive book for learning the fundamental concepts and skills of the field. In the seven years since the 4th edition was published, there has been a great deal of new information gathered to warrant this new edition. This 5th edition integrates hundreds of new studies and many topics only lightly touched on before have now been expanded. There are new chapters on treating depression and the use of process oriented hypnosis, and the previous considerations of the subjects of pain and metaphors have been expanded to full chapters. This 5th edition also includes more sample transcripts in order to illustrate how hypnotic processes might be structured and delivered. This 5th edition has a companion website developed by the publisher (Routledge/Taylor & Francis) to give readers access to more information than could be included in the book due to space limitations. The Companion Website has the complete reference section (more than 1000 references) as well as the earlier four versions’ Forewords and Introductions. Also on this companion website readers will be able to watch Dr. Yapko’s moving session with a cancer patient named Vicki along with a PDF download providing the session transcript. This emotionally powerful and technically excellent session highlights the power to change clients’ lives for the better with hypnosis. There are also links to other examples from colleagues highlighting the use of hypnosis for various clinical purposes. In addition, the “Frames of Reference” sections have been updated for all living pioneers in the field. One new “Frame of Reference” has been added to highlight the amazing accomplishments of Marie Elisabeth Faymonville, M.D., Ph.D. She is a courageous pioneer in the field who uses hypnosis to manage pain and conduct surgeries with limited or no anesthesia. Section 1: Conceptual Framework. Thought Before Action: Developing a Deeper Understanding of Hypnosis. A Kaleidoscope of First Glimpses of Hypnosis. The Myths About Hypnosis and a Dose of Reality. Says of Thinking About Hypnosis and How They Shape Your Practice. The Brain , the Mind and Hypnosis. . Hypnosis and Health: Amplifying the Mind-Body Relationship. The Subjective Experience of Hypnosis. Contexts for Applying Hypnosis and the Atmosphere You Create. The Social Psychology of Human Suggestibility. Responsiveness to Hypnosis: Demographic Factors and Assessment Tools. Hypnotic Hazards, Legal Considerations, and Ethical Guidelines. Section 2: Practical Framework. Hypnosis in Action: Developing Skill and Artistry in Clinical Practice. Structuring Suggestions: Generating Intentional Language. Practical Tips for Conducting Effective Clinical Hypnosis Sessions. Structured Techniques of Hypnotic Induction: Doing Hypnosis. Conversational Approaches to Hypnotic Induction and the Art of Being Hypnotic. Hypnotic Phenomena: Mobilizing Hidden Abilities. Designing and Delivering Clinical Hypnosis Sessions. Integrating Strategies of Clinical Hypnosis in Psychotherapy. Metaphors in Hypnosis: Here’s the Story. Hypnosis and Positive Psychology: Focusing on What’s Right. Process-oriented Hypnosis: From Asking How Questions to Building the Hypnotic Context. Examples of Hypnosis Sessions: Transcripts for Common Problems. Hypnosis and Treating Depression: Empowering the Disempowered. Clinical Hypnosis in the Management of Pain. Hypnosis With Children and Adolescents. Managing Unexpected Reactions. Hypnosis Across Modalities: Parallel Processes in Hypnosis and Mindfulness Meditation. About Michael D. Yapko, Ph.D.
Foreword by Irving Kirsch, Ph.D. Appendix C: Forewords and Introductions to the Previous Four Editions of Trancework. “Michael Yapko’s books are gifts that keep on giving, and the 5th edition of Trancework is no exception. In this updated and expanded version of his classic text, Yapko provides a state-of-the-art and state-of-the-science overview of clinical hypnosis. With his trademark thoroughness, balanced view, and clear writing, Yapko has provided another valuable contribution that is a joy to read. Trancework not only provides practical and detailed descriptions of the most effective hypnotic techniques, but gives clinicians the background knowledge needed to use these techniques most effectively. It is clear why Trancework is used so often as a basic textbook for teaching hypnosis.” – Mark P. Jensen, Ph.D., Professor and Vice Chair for Research, Department of Rehabilitation Medicine, University of Washington, and author of Hypnosis for Chronic Pain Management. “Michael Yapko’s new fifth edition of Trancework is much more than an introduction to the field of hypnosis: it is an essential book that provides insights and skills related to hypnosis that all practitioners and students of clinical hypnosis will want to master. Trancework highlights Yapko’s lifelong passion for his mission of advancing the field by articulating the proven benefits of clinical hypnosis in contributing to the well being of patients’ body, mind and soul.” – Consuelo C. Casula, internationally known author and teacher and past president of the European Society of Hypnosis. 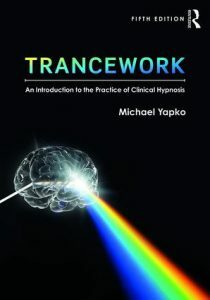 “Michael Yapko’s new fifth edition of Trancework highlights his encyclopedic knowledge of hypnosis which he shares with the reader in an easy-to-use, practical format. Yapko’s organization of the text is logical and progressive, featuring balanced and unbiased explanations of controversial issues in the field as he explores both the art and science of hypnosis. The chapter entitled “Process Oriented Hypnosis: When How Matters More Than Why” is particularly unique in its consideration of the role of hypnosis in short term psychotherapies and describes one of Yapko’s most unique contributions to the field. This is truly the definitive book on clinical hypnosis. If you are to purchase only one book about hypnosis, Trancework is the one!” – Jeff Lazarus, MD, FAAP, Private Practice, Menlo Park, California, Former Associate Clinical Professor of Pediatrics, Case Western Reserve School of Medicine, Creator of the home video programs Keeping the Bed Dry® and Controlling Your Gut Feelings®. “Michael Yapko’s fifth edition of Trancework is an exceptional book. Yapko’s extensive knowledge of the latest scientific research findings in combination with his practical clinical guidance provide readers a text written with clarity, relevance and wisdom. The special “Frame of Reference” sections connect the reader to hypnosis luminaries and their important contributions to the hypnosis field. This book is a treasure and a “must read” for both beginning and seasoned clinicians.” – Moshe S. Torem MD, Past President of the American Society of Clinical Hypnosis, Chief of Integrative Medicine, Cleveland Clinic-Akron General, and Professor of Psychiatry at Northeast Ohio Medical University. “This is a new 5th edition of a classic book by Michael Yapko, who is arguably the most active and prolific conventional writer in the field of clinical hypnosis. This is truly a breathtaking work on how to learn hypnosis and apply it to human suffering. While “introductory” at some levels, it offers one of the best available discussions of the complexity of the field. The scope of this volume, and the respect it shows for the great writers in the field, will be hard to replicate.” – David R Patterson, PhD. Author of Clinical Hypnosis for Pain Control. “Yapko has done it again. His revised Trancework keeps its place as the most comprehensive and practical text on weaving hypnosis into clinical practice. Yapko’s mastery is in his ability to guide us to a coherent conceptualization of hypnotic strategies while making them immediately accessible. Trancework 5 teaches the indispensable core of hypnosis in therapy and so remains the essential text.” – Laurence I. Sugarman, M.D., F.A.A.P., A.B.M.H. College of Health Sciences and Technology, Rochester Institute of Technology. Co-author/editor, Therapeutic Hypnosis with Children and Adolescents, 2nd edition.